Pure barium is rarely used outside the laboratory. Barium compounds are found primarily in two ores (minerals from which valuable substances, like metal, can be removed). The first ore is barite and the second is witherite. 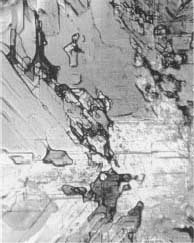 Barite contains a sulfate (a salt of sulfuric acid) compound while witherite contains barium carbonate (a salt of carbonic acid). While barium and all of its soluble (dissolvable) compounds are poisonous, barium sulfate is used in medical procedures because it will not dissolve in water or other body fluids. Barium sulfate is used in medical procedures because it does not dissolve in water or other body fluids. Like other metals, barium is a good conductor of heat and electricity. It is silver and white in color and relatively malleable (flexible). Chemically, it resembles calcium and strontium, fellow members of the alkaline-earth family of metals. Barium gets its name from the Greek word for barys, which means "heavy." During the 1700s, chemists thought that barium oxide and calcium oxide were the same substance. In 1774, Carl Wilhelm Scheele showed that barium oxide is a distinct compound. After electric batteries were invented in the 1800s, chemists began using electric currents to break compounds apart. Humphry Davy, who pioneered this technique, later called electrolysis, discovered barium in 1808. Davy produced barium for the first time by passing an electric current through molten barium hydroxide. He also used electrolysis to isolate potassium, sodium, calcium, magnesium, and strontium. Barium's many compounds have a number of practical applications. Perhaps the most familiar is the one used in a medical procedure, the barium enema. When doctors need to examine a patient's digestive system, a mixture containing barium sulfate is used to coat the inner lining of the intestines. Similarly, to enhance examination of the stomach and esophagus, the patient drinks a chalky barium sulfate liquid. When the patient is X-rayed, the barium coating inside the digestive tract absorbs a large proportion of the radiation. This highlights the black-and-white contrast of the X-ray photograph, so that doctors can better diagnose digestive problems. Barium also has many industrial applications. Although pure barium metal can be used to remove undesirable gases from electronic vacuum tubes, barium's compounds are much more important to industry. Barium sulfate is a component of lithopone, a white pigment used in paints. Barium carbonate is used in the production of optical glass, ceramics, glazed pottery, and specialty glassware. The sulfate is also an ingredient in oildrilling "muds" or slurries that lubricate the drill bit. The bright yellow-green colors in fireworks and flares come from barium nitrate. Motor oil detergents, which keep engines clean, contain barium oxide and barium hydroxide. I am due to have a series of tests for COPD and barium will be used. Is this a danger to my health? What is the standard composition of the barium meal put into the human body?